Get your Palico some fancy new Mega Man armor and a Mega Buster in Monster Hunter: World by tracking down and completing the Mega Man quest. Putting some shiny new armor on your Palico is what makes Monster Hunter: World so great, and now hunters on Xbox One and PlayStation 4 can unlock the Mega Man armor for their little cat friends to wear. 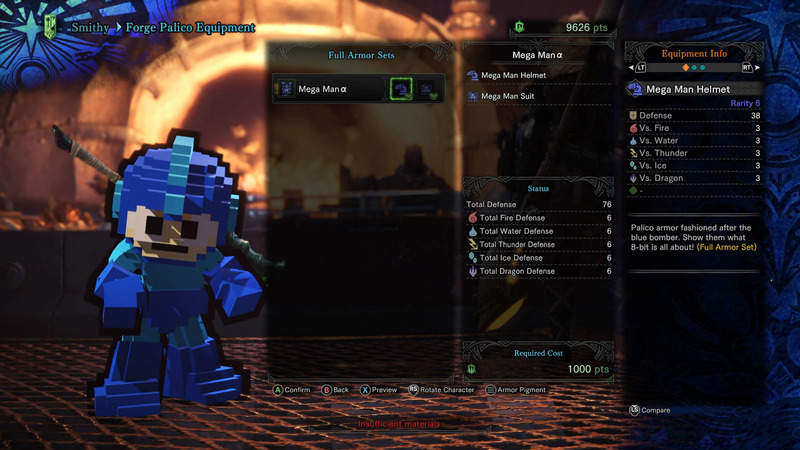 The Mega Man armor resembles an old-school, 8-bit Mega Man, replete with a Mega Buster for your Palico to use. Earning it is as simple as tackling the Mega Man themed quest A Rush of Blood and using special Tickets to assemble the unique armor. To unlock Mega Man armor, visit a Quest Board. Select Events and then A Rush of Blood. Defeat the two Odogarons within the faint- and time-limits. Collect the Mega Man Ticket. Repeat the quest until you have enough Mega Man Tickets. Finally, visit the armory and use 5 Mega Man Tickets to unlock the Mega Man Armor and Mega Buster. Begin the quest by logging into Monster Hunter: World and going online. 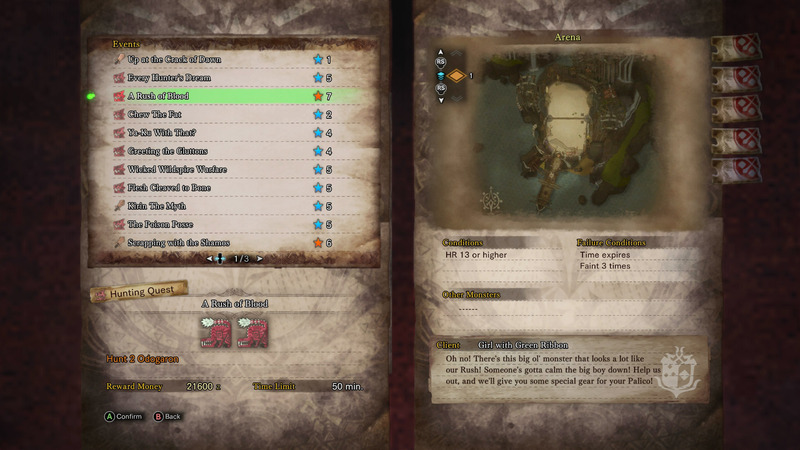 When you reach Astera, visit the closest Quest Board or Quest Lass, select Events and then find A Rush of Blood in the list. This is a Hunter Rank 13 quest with a High Rank 7 difficulty rating, so it’s a good idea you’ve got High Rank quests unlocked and are prepared for the challenge. 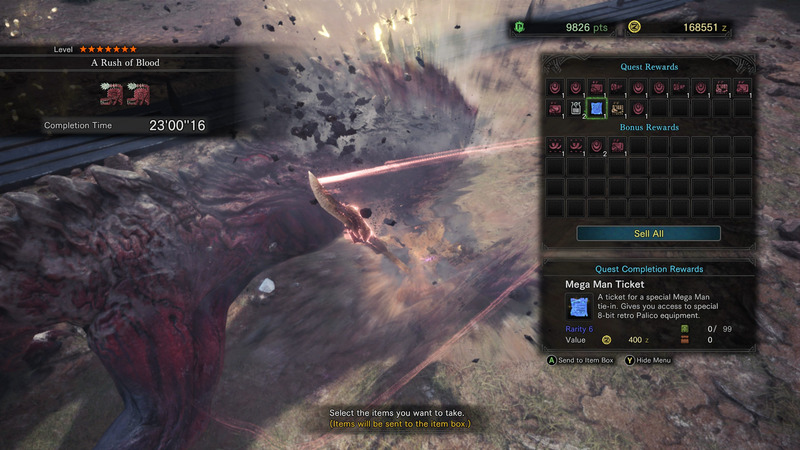 A Rush of Blood pits you against two Odogarons, one tiny version and one normal-sized. You can either fight them together or defeat the little one before moving deeper into the arena to take on the bigger one. You are only afforded three faints, so be sure to keep your health stocked up. It’s a good idea to visit the canteen for some food before you head off on the quest. Once the two Odogarons are defeated, the mission will end and you will receive one or more Mega Man Tickets. To unlock the full Mega Man armor and Mega Buster for your Palico, you will need 5 Mega Man Tickets. You may need to repeat A Rush of Blood five times before you have enough tickets, so get ready for a bit of a grind. By undertaking these Mega Man-themed quests, hunters should have no problem earning the Tickets they need to assemble the Mega Man Armor. Monster Hunter: World continues to have new content added every few months, so make sure you stick with Shacknews for all the Monster Hunter: World info you need.